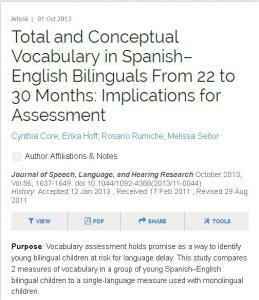 To understand the purpose and findings of this article it is beneficial to know the difference between total and conceptual vocabulary. Total vocabulary is the sum of the words a child knows across two languages. Conceptual vocabulary gives the child credit for knowing concepts rather than words, and concepts that are represented in both languages are counted only once. So basically, when looking at a bilingual child’s total vocabulary you would count both the word perro and the word dog. If you were looking at conceptual vocabulary you would only give the child credit for knowing one concept: the furry, four-legged creature in my house which barks and eats kibble is a dog/perro. Receptive and Expressive Semantics: Does Bilingual Experience Matter? The short answer is yes. But, the longer answer is more interesting I think. It’s well-known that we can understand more words than we can express. Generally though, there are strong associations between receptive and expressive language, the more words you understand the more words you can express. We see normal receptive-expressive gaps in early language development, later development, as well as in mature learners. As adults, there are words that we can recognize by context in reading for example, but don’t use them expressively or don’t consistently recall them. On standardized tests however, these inherent differences between the two kinds of tasks are controlled. We can compare performance on expressive and receptive tasks through use of standardized scores often using a mean of 100 and a standard deviation of 15. Large receptive-expressive discrepancies where receptive knowledge is much stronger than expressive knowledge can be an indicator of language impairment. How does this work in bilinguals?